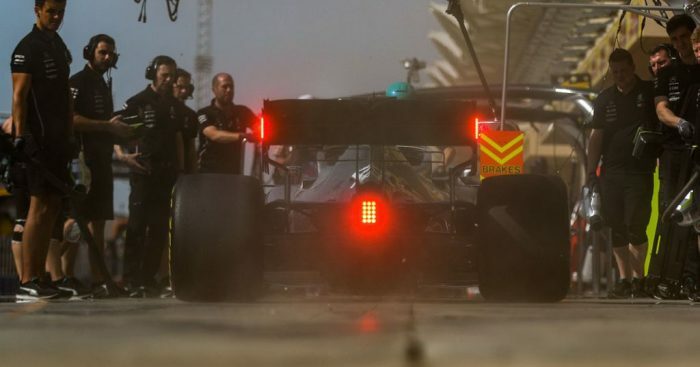 Lewis Hamilton was shocked to get anywhere near the Ferraris in qualifying for the Bahrain Grand Prix due to their straightline speed. The Scuderia would claim a one-two headed by Charles Leclerc for the race tomorrow, but Mercedes found some serious pace in Q3 with both drivers coming within a tenth of Sebastian Vettel’s time for P2. However, the reigning World Champion is shocked by the speed advantage Ferrari have on the straights, and even more so that the Silver Arrows threatened Vettel after being well off the pace in practice and Q1/2. “We have seen incredible pace from the Ferraris,” Hamilton told reporters in Sakhir. “Honestly I didn’t know we would be as close as we were at the end. “For us the car has felt okay, I just think over the years it has not been a circuit that particularly suited our car for whatever reason, but we got into quite a nice place today and end of straight speeds was really where we lost a lot of time. Congrats @Charles_Leclerc on your first @F1 pole 🤝 That was some lap! Mercedes principal Toto Wolff said that the team have already started their “post-mortem” to try and figure out where Ferrari’s speed is coming from. “On long runs we were doing OK, that looked good,” he told Sky. “But we are lacking in straightline speed at the moment – whether that is track or power, we need to analyse. Asked if he suspected it was power or car drag related, Wolff said: “For sure it’s a combination of the two. Valtteri Bottas wasn’t thrilled with P4, but acknowledged that a 0.07s gap to team-mate Hamilton was hardly a disaster. “It was OK in qualifying but it could have been better,” Bottas admitted. “It was pretty close between Lewis and me, I think he just got a bit better laps in the early runs, in Q2, and I had to chase him a little bit. In Q3 I was pretty pleased with my lap in the last run but all the weekend I haven’t been really able to nail a proper lap. “I can see the differences and it’s small things here and there, I could have definitively been quicker today, but it was not the easiest car to drive in qualifying.